When will be Hotel Impossible: Showdown next episode air date? 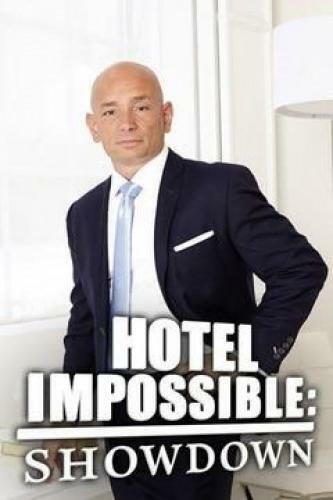 Is Hotel Impossible: Showdown renewed or cancelled? Where to countdown Hotel Impossible: Showdown air dates? Is Hotel Impossible: Showdown worth watching? Hotel Impossible: Showdown is a winner takes all competition, where four amazing hotels, inns and B&B's go head to head for a $25,000 prize. Hotel expert Anthony Melchiorri follows the four very confident hoteliers, as they spend the night in each other's establishment, with an exacting eye for details, both positive and negative. Then they award up to five stars each for accommodations, amenities, hospitality and overall experience. The property with the highest score wins the coveted $25,000. Anthony Melchiorri follows four Texan hoteliers as they showcase their properties for $25,000 cash. They learn to cook and one hotelier entertains the others with her brash, fun-loving personality. Some gin accentuates the party. Four Arizona hoteliers travel the desert to sample restaurants, tour historic sites and gear up on bikes; some enjoy a dark and morbid art gallery. Four Florida hoteliers travel to each other's property while enjoying a crab dinner on the beach, a kayaking adventure and a relaxing cruise with live dolphins. Four Florida hoteliers get spooked on a ghost tour, enjoy Miami Beach and get jealous over another's backyard Jacuzzi. Hotel Impossible: Showdown next episode air date provides TVMaze for you. EpisoDate.com is your TV show guide to Countdown Hotel Impossible: Showdown Episode Air Dates and to stay in touch with Hotel Impossible: Showdown next episode Air Date and your others favorite TV Shows. Add the shows you like to a "Watchlist" and let the site take it from there.